The Story Mill Community Park has been honored as the 2017 recipient of the President's Award of Excellence presented by the Idaho Montana Chapter of the American Society of Landscape Architects (IMASLA). Submitted by the project's lead design firm, Design Workshop of Colorado, this prestigious award recognizes the project's excellence through design development. The President's Award is the highest level of recognition given by ASLA at the state level. This award is given only once every other year and only if a project is determined to be exceptional by a unanimous vote of the jurors. The award was chosen by the jurors among 20 entries in many design categories. If you’ve been following the news, you know that public lands are facing unprecedented threats. But the great outdoors also has strong defenders: they come from all walks of life and across the political spectrum, and they’re ready to speak out. The Trust for Public Land, in collaboration with Teton County, Idaho, and the Teton Regional Land Trust, announced today that the 80-acre Bates Teton River Access Park has been conveyed to Teton County. 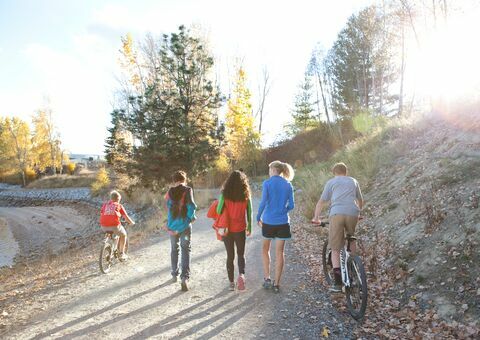 The Bonner County Trails plan combines community input with state-of-the-art mapping software (GIS) and computer modeling, and builds upon the County's 2014 draft trail plan. The Trust for Public Land, the U.S. Forest Service, the Idaho Department of Lands, and the Stimson Lumber Company today announced they have permanently protected 6,847 acres of forestland in northern Idaho. The land will remain in active timber production; protect wildlife habitat; and be forever available for public hunting, fishing, hiking and outdoor recreation. The 157-acre Rodeo Grounds Ranch, which once hosted the historic 4th of July Custer County Rodeo in the 1930’s, is now permanently protected, The Trust for Public Land announced today. The property, located just 5 miles north of the town of Stanley, Idaho, was one of the largest unprotected properties still remaining in the Sawtooth National Recreation Area. The Trust for Public Land today announced the purchase of a critical 80-acre private property in the heart of the Frank Church-River of No Return Wilderness in the Salmon-Challis National Forest, Idaho.